Deep-sea Anglerfish are the strange and elusive creature that are very rarely observed in their natural habitat. Fewer than half a dozen have ever been captured on film or video by deep-diving research vehicles.They are mostly found in tropical to temperate waters of the Indian,Pacific and Atlantic Oceans. Here is a video from the deep dark waters of the Monterey Canyon, supposed to be the first video footage ever made of this species alive and at this depth. 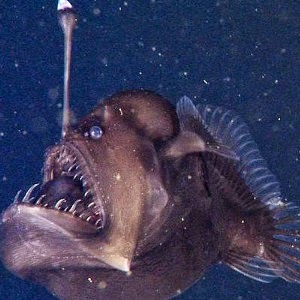 The Angler fish shown here is called Black Seadevil and it is about 9 cm and also known as Melanocetus. A female black seadevil is shown in the video . Look at the teeth arrangement and its terrifying look. They can easily catch the slightest movements near them with this help of thousand of sensors. These creatures are deep sea Lophiiforme fishes and female fishes have a remarkable apparatus on their heads, ie, a fishing pole with luminous lure at the tip to attract its prey. This luminescent organ is called "Esca". In the darkness of deep water they flash the light to attract prey and draw them near to angler's mouth. When a fish or a squid comes near, it is quickly inhaled by the angler's huge mouth and will be trapped in its long and sharp teeth. Females uses Esca to attract males to facilitate mating. In this species Males are much smaller and they lack the fishing pole and luminous lure. male are ill-equipped for feeding and their sole responsibility appears to be to find a female mate and mate with. They have a threatening or baleful appearance and typically pitch black skin with gelatinous body, large head, small eyes, they are of hideous nature and prefers dark habitat. Females may reach upto 18 cm but males are smaller. They have lots of sensors which looks like tiny pale dots to detect slightest movements of other animals around it. They belongs to "Melanocetidae" family. Humans have very limited knowledge about this amazing creature.